In addition to support for business practices of a diverse array of business categories, Plaza-i is equipped with multi-language/currency functions as its standard functions, which are in high demand among foreign companies and companies handling foreign trade. Support of foreign-currency entry, as well as home currency. Automatic conversion of entered currency to home currency. Matching currency for both foreign- and home-currency entries. Evaluation and record-keeping of realized and unrealized exchange gain/loss at the end of each month. Financial statements in both home and foreign currency denominations. 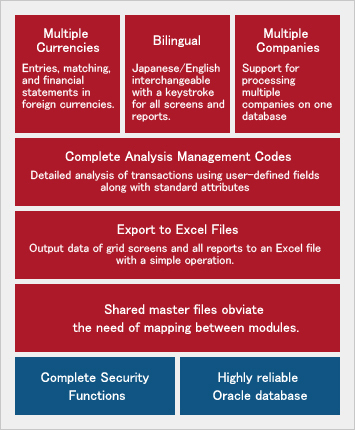 Japanese and English languages interchangeable with a keystroke for all screens and reports. Reports generated in English when entering data in Japanese screens. Screens shown in English, enabling non-Japanese managers to review data. Support of multiple companies on one database. Production of financial statements that sum up the amounts of all the companies, compare the amount of each company or show the amounts by branch of all the companies. Shared common master files offered, such as client, item and G/L account, eliminating the need to work up database mapping between modules. Additional 10 user-defined analysis fields for master files – e.g., “item master”; “client master”; or “person master” – along with standard attributes. The same goes for transaction details of sales orders, sales, purchase orders, purchases or inventory transactions. Up to 10 different analysis dimensions – e.g., “organization”; “client”; “employee”; “bank account”; “project”; or “user-defined code” in the accounting module. 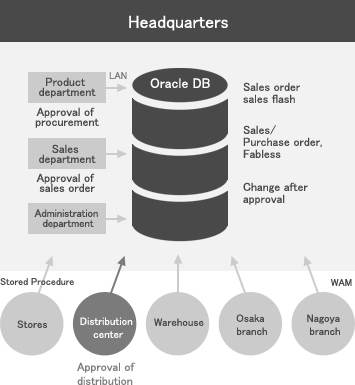 Highly-reliable Oracle database. Safe and quick process secured by using stored procedures. Standalone system, or in a LAN or a WAN environment. Server-based computing – e.g., WTS (Windows Terminal Services) or MetaFrame(CPS), which is effective in a network environment with a narrow communication band. Controlled accessible menus by user group – e.g., administrator group or purchase group. Controlled accessible companies, branches or organizations by user. Transference of data for each report to an Excel file with a simple operation.